I am mounting this speed reducer pulley on my Consew 255-RB3 to make it double duty for sewing thicker leather projects. My father had this setup on his machine. The pulley acts as a flywheel and it will sew slowly through anything. 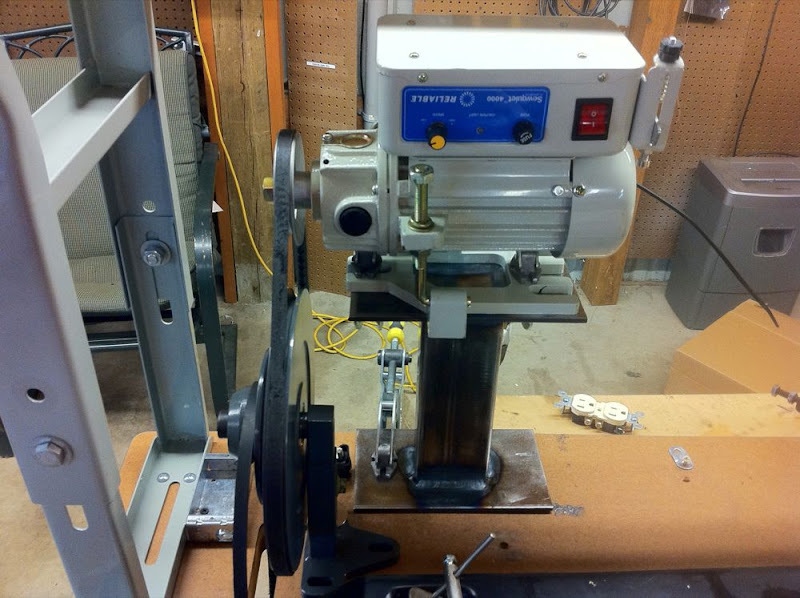 The reducer combined with the servo motor makes for a very versatile machine. 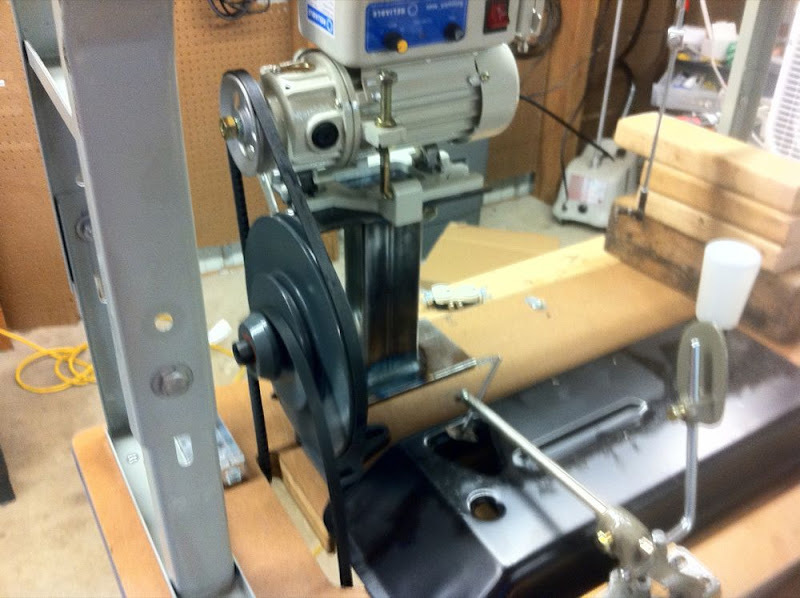 It does help that I got the pulley setup from my father and I have a fabrication shop to make the motor stand. Follow up on the setup I posted above. I tried it out yesterday. It is great for going through thick leather, especially more than one layer. 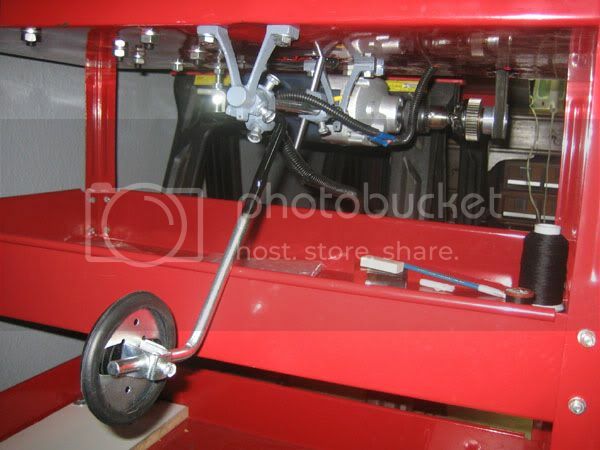 The speed-reducer pulley setup acts as a flywheel though. The motor can't stop it quickly at all because of the rotating mass involved. 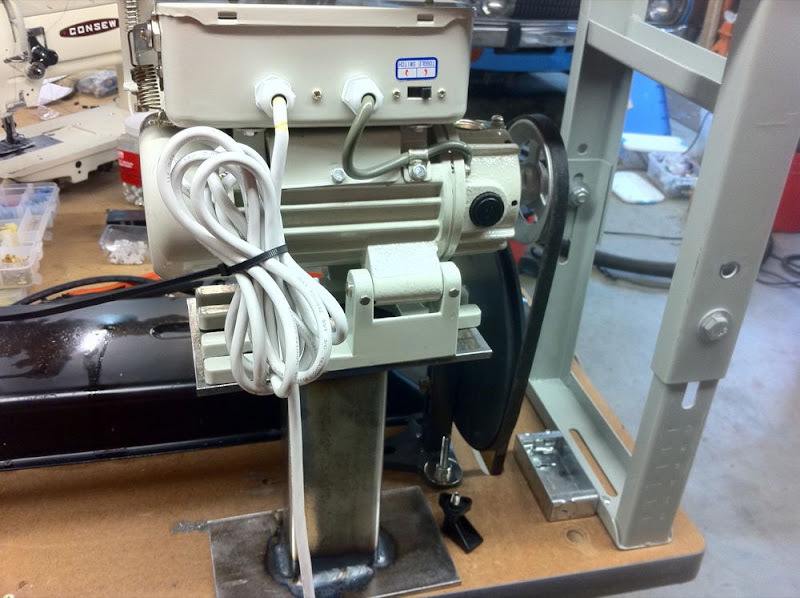 So, I removed it from my machine and am using the Sewquiet 4000 motor by itself. It works great for upholstery projects. I'll use something else for the occasional leather work that I do. I just got my sewquiet 4000 today, man this thing is tiny compared to the clutch motor it is replacing. Its also nice and slow, perfect for me to learn with. Thanks for all the recommendations. I'll post pic's tomorrow of my Consew 206rb5 that I just bought and am driving with a HF drill motor. You may laugh now, but it may not be so funny when you see it. 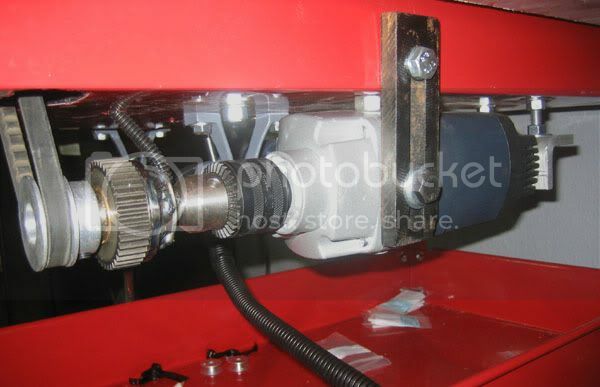 For $60 you can have a drive system that will kill any gear reduction servo motor on the market. If you don't need real fast speed, this will give you maximum control. No brag, just fact? And his name is Walter Brennan. And you have what, like 2 minutes of experience on an industrial sewing machine? My suggestion to you is to listen to somebody who has actually sewed two pieces of fabric together for a living. Why do you people think you have come up with a better mousetrap when THOUSANDS of other people with THOUSANDS of hours of experience haven't come to the same conclusion as you? This is what I've done for a living for my entire life, 38 years worth. You have done it as a hobby for 45 seconds and you have all the answers? Learn to use the sewing machine you have. There is nothing more valuable than EXPERIENCE. You can't buy a sewing machine, and slow it down to a crawl, and expect to be an expert after 2 hours. Slow the machine down? How about learning to use it just like it is? Doesn't anybody want to know how to do that? I'm sorry, but you are ALL way out of line. Post on any other forum and see if your ideas get anywhere.Post on Body /Exterior and see how far you get promoting painting a car with a brush. You want advice from professionals, but you'd rather take 1 minute of advice and then do what you think will help you do something professionals have trouble with? I give up. I am frustrated to the Nth degree. You get world class advice and you spit in my face. Why on earth would I spend my free time to give you THE BEST ADVICE IN THE WORLD to have you post some ridiculous bull spit as gospel truth? No one lives forever, the trick is creating something that will. Last edited by DanTwoLakes; 06-24-2011 at 12:11 AM. welcome to my world dan exactly why i have stopped posting in the body forum. i for one am glad your here and appreciate your time. i should have a machine soon as a friend is a rep for a trim supplier. looking for a deal on a used one. we are gathering up scraps to start with. if i can manage not to sew my fingers together maybe i can learn to be a sticther . ignore the google warriors . they don't stay around long. i spewed coffee at the hf drill motor. only thing worth carring out of hf is the cash register. Sorry about that. The older I get the more frustrated I get with the instant gratification world we live in now. Come on, use the machine for what it is made for like it was made. I'm a rank beginner and Dan has helped with every post. Listen to the master. Yes, I have sewed my finger, sewed a shirt sleeve to the project, sewed a couple feet with a broken thread and few other humorous things but I'm learning. I also have completed a complicated headliner, a heavy vinyl cover for my big generator as well as for the small one, a race car seat cover, repaired my welding gloves and leather jacket, I even made a couple dog leashes. I'll get a servo motor soon but for now I have just a 1 3/4 pulley which works just fine. Still plenty fast but does a nice job. Dan, please keep the tips coming for those of us who sit in the front row of your class. We take notes and study them when we get home for our lessons. The SewQuiet 4000 will do exactly what you want it to do without doing anything to it. 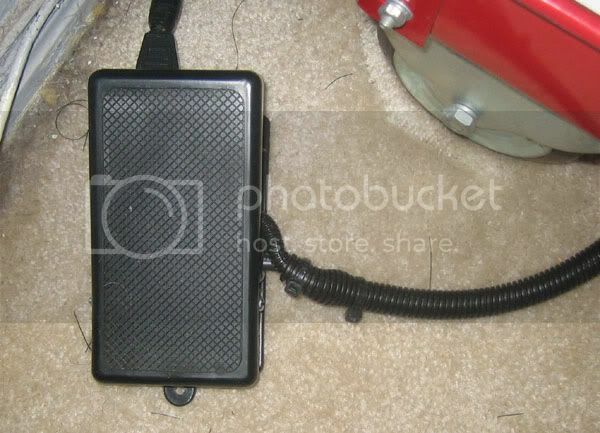 All you need to do is learn how to use the foot pedal. A servo motor has constant torque throughout the speed range, so you have just as much torque at one stitch a minute as you do at 3300 stitches a minute. Why not just turn the wheel by hand? That's not a knee switch, it's the knee lift for the foot, it's just been extended out in front of the cart the machine is on. It looks like there's a foot pedal on the other end of the wire coming from the drill that you can see in the first picture. It also looks like there is a pick-up on the gear next to the pulley that would provide the feed back to give the drill variable control. There's no other reason for there to be a gear there. Looks like your right Dan on foot pedel,I guess I was thinking the trigger for drill was also a speed control trigger,so putting a nee arm on to it would be pretty good way to run it. You know no extra stuff that way. Still claver set up at lest. Sorry, meant to in include one of the pedal. The pedal is a cheep on/off that I put the drill trigger into. Was very easy to do. 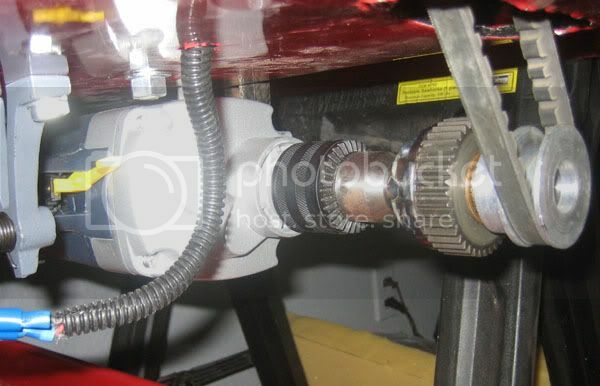 The gear looking thing is a one way clutch from a starter motor. The teeth do nothing but could not be removed. It was needed so that you can turn the hand wheel freely. A gear reduced servo motor would possibly work better, but I am not sure exactly how except that max speed is about as fast as a home machine. 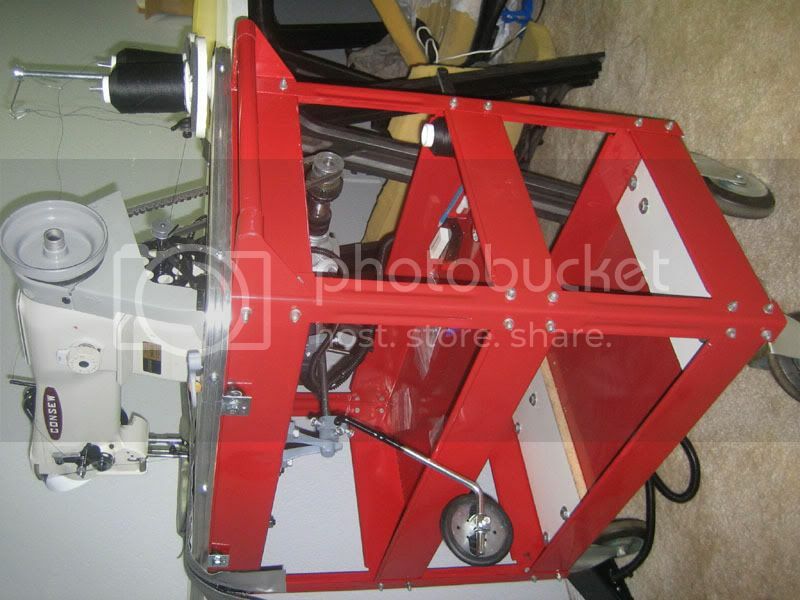 It will go through 8 layers of expanded vinyl with 207 thread at a stitch every 15 seconds and not complain at all. Anyway, for $55 total just another option.